There are some adept sensible Democrats out there, but none were present in this first debate. A lot of political analysts and pundits are predicting that the Democratic Party will have a banner year in the upcoming midterms. Goodness knows the Republicans are doing all they can to help them. Before you decide to change your voter registration from Republican to Democrat and show your displeasure with Trump, and the feckless bunch of Republican do nothings in Congress that would rather investigate Trump than represent their constituents take a look at what is happening around you. 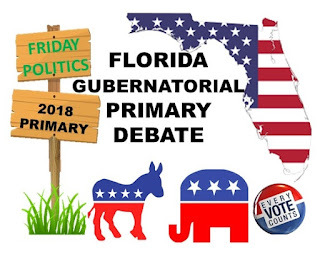 The first debate featuring four of the Democratic candidates for Florida Governor was an interesting affair. If I had to pick a central theme(s) it would be let’s raise taxes, shut down funding of charter schools, raise some more taxes, put in some more social programs and continuing pouring money into a failing educational system even though none of them knew what the education budget was. In other words, these candidates are proposing what Democrats do; replace governance with social welfare. You can check out the debate at: FOX 13. Florida has experienced phenomenal growth over the last eight years. The economic infrastructure that supports that growth has been carefully put together. Looking at the Florida economy as an apple ready for picking could quickly undo what eight years of hard work has accomplished. Just electing a bunch of Democrats to offices from the school board to the State house and Governor will not cure anything. An old-line social programs Democrat in the Governor’s mansion and one or both houses of the Florida Legislature controlled by the Democrats will bring the current growth trend in Florida to a screeching halt. The real questions are: can any of these candidates morph into someone who can actually run a government and not turn it into one massive welfare program and secondly are there any of these candidates you want to bet your small business on along with the education of your children?